Both the ancient Sanskrit and Egyptian writings clearly reveals the practices that were followed for keeping the water pure and germ free. "Sushruta Samhita" The Sushruta Samhita is a Sanskrit text from 3rd or 4th century AD, on all of the major concepts of ayurvedic medicine with innovative chapters on surgery, attributed to Sushruta. He is widely considered the "Father of Surgery". 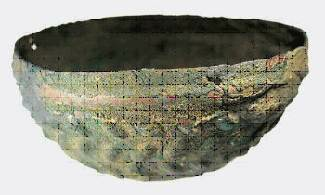 The methods specified in the Sushruta Samhita includes: Boiling, heating under sun, or dipping heated iron into the water. The text also reveals the filtration process according to which water can be purified filtering it through sand and coarse gravel and then allowed to cool. Other purification methods included the use of a kind of stone, known as "Gomedaka," and the seed of Strychnos potatorum. In other Sanskrit text, Ousruta Samhita filtering through charcoal method is given. Centuries later, Hippocrates, (Baker & Taras, 1981). The famed father of medicine began to conduct his own experiments in water purification. He created the theory of the "four humors," or essential fluids, of the body that related directly to the four temperatures of the seasons. According to Hippocrates, in order to maintain good health, these four humors should be kept in balance. As a part of his theory of the four humors, Hippocrates recognized the healing power of water. For feverish patients, he often recommended a bath in cool water. 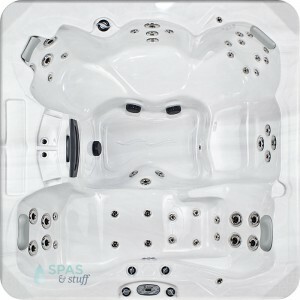 Such a bath would realign the temperature and harmony of the four humors. Hippocrates acknowledged that the water available in Greek aqueducts was far from pure in its quality. Like the ancients before him, Hippocrates also believed good taste in water meant cleanliness and purity of that water. 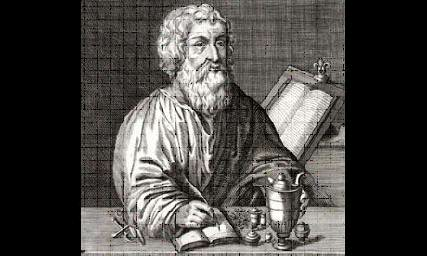 Hippocrates designed his own crude water filter to "purify" the water he used for his patients. Later known as the "Hippocratic sleeve," this filter was a cloth bag through which water could be poured after being boiled (Baker & Taras, 1981). The cloth would trap any sentiments in the water that were causing bad taste or smell. 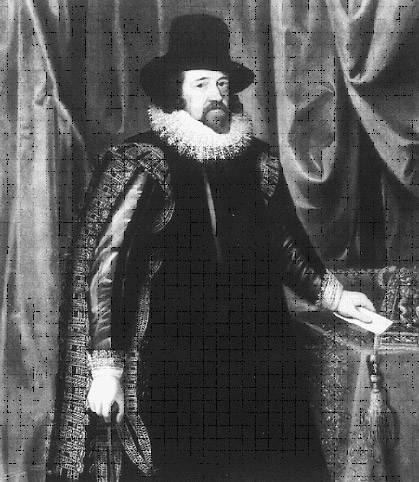 Sir Francis Bacon in his famous compilation "A Natural History of Ten Centuries" 1627 (Baker & Taras, 1981) talked elaborately about desalination, basically first record of experimentation in water filtration, after the blight of the Dark Ages, According to him if seawater is allowed to percolate through the sand, it can be purified. Bacon believed that if he dug a hole near the shore through which seawater would pass, sand particles (presumable heavier than salt particles) would obstruct the passage of salt in the upward passage of the water; the other side of the hole would then provide pure, salt-free water. Sadly, his hypothesis did not prove true, and Bacon was left with salty, undrinkable water. His experiment did mark rejuvenation in water filter experimentation. However, this publication did inspire scientists to continue to experiment with water filtration technology. The experiment of sand filtration was first illustrated by the famous Italian physician Lucas Antonius Portius. He wrote elaborately about the multiple sand filtration method in his famous book "Soldier's Vade Mecum". He illustrated water filtration experiment by using three pairs of sand filters. 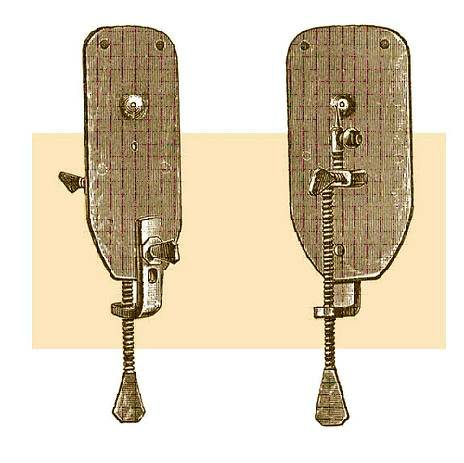 A century later, Anton van Leeuwenhoek, considered the father of microscopy, built upon the Janssen's simple invention. By grinding and polishing the tiny curved lenses, he was able to reach magnifications of up to 270 times the original object (Wilson, 1995). This advanced microscope had a great effect upon the study of water purity and water filtration. Scientists were now able to view tiny material particles present in water that had been presumed to be clean. Anton van Leeuwenhoek used his discovery of the microscope to see and describe the teeming life in a single drop of water. Robert Hooke, considered the English father of microscopy, confirmed Leeuwenhoek's descriptions of tiny, living organisms in a drop of water and further refined the microscope. Soon scientists were examining tiny particles of life they had never before seen nor known existed prior to the invention of the microscope. The microscope has an interesting place in water filter history. In mid-19th century London, where diseases ran rampant because of the tight quarters of the working class, city officials began to link the spread of cholera to poor drinking water quality (Baker & Taras, 1981). In areas where sand water filters had been installed, the outbreak of cholera had greatly decreased. To further corroborate this conclusion, In 1854, the British scientist John Snow found that the cholera disease was spread through contaminated water, a discovery that would greatly impact the future of water treatment and disinfection. While studying cholera epidemics in municipal areas of England, Snow noticed that regions that used slow sand filtration before distributing water tended toward fewer cholera cases. Eventually, he was able to trace the outbreaks of cholera to a particular water pump that had been contaminated by raw sewage. Ironically, this was from a pump that was known to produce good tasting water, once again divorcing "good taste" with purity. 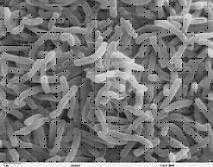 Snow used chlorine to kill the cholera bacteria in the water, leading to the rise of water chlorination as an effective disinfection process. His work also revolutionized the prevalent theory that good-tasting and odorless water naturally meant it was healthful and safe. Because the contaminated water had contained no detectable taste or odor, Snow surmised that water quality could not be established by those criteria alone. After his findings were published, several cities began to treat all water with sand filters and chlorine before distributing it to the public. As British government officials noted the effect of water quality on cholera outbreaks, both through Snow's discovery and through the evidence of decreasing cases of cholera where sand water filters had been installed, they mandated the installation of sand water filters throughout the city. This mandate was one of the first instances of government regulation of public water and would set a precedent for municipal water systems. By the early 1900s, water treatment experimentation had turned from the prevention of waterborne diseases to the creation of softer, less-mineralized water. Water softeners, which use sodium ions to replace water-hardening minerals in water, were first introduced into the water treatment market in 1903. The theory of ion exchange (in which a harmless or more desirable water ion is used to replace a harmful one) implemented by the softening systems would greatly impact the water treatment industry in later years -- the theory would eventually be used to remove lead, mercury, and other insidious heavy metals from water. The Filter in Your Pool or Spa "The History of Spa Filters"
The filter is the hardest worked piece of equipment on your swimming pool or spa. Pool filters and Spa filters work round-the-clock to filter impurities so you can enjoy pure water. You'll want a durable pool or spa filter that will remove even the smallest debris and sediments from your water. Here is some helpful advice to assist you in selecting a swimming pool filter or spa filter. These filters use - you guessed it - sand as the filtering medium. Sand filters look like large balls and they hold hundred of pounds of pool-grade sand. Basically, water flows into the top of the filter housing and makes its way down through the sand bed where the sharp edges of the sand catch the dirt. On a micron-to-micron comparison, sand filters remove the least amount of dirt - particles as small as 20 to 25 microns. But again for a time, the dirt left behind contributes to the filtering process. Sand filters certainly are efficient enough to keep just about any pool clean. To keep a sand filter working, depending on the size of the filter you must clean it as often as once a week during swimming season. Maintenance means backwashing where the flow of clean water is reversed back into the filter. The problem with this, however, is that back-washed water is simply wasted. A typical back-washing session can waste a few hundred gallons of water - water that must be replaced in the pool. Cartridge filters have been around for some time, but they seem to be gaining in popularity in many parts of the country. They consist of a tank that houses three or four cylindrical filtering elements. The filters are actually made of polyester or some other material that can provide a superfine filtering surface. 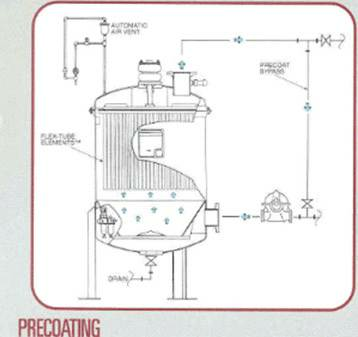 The fabric catches and holds the impurities until you clean or replace the filter. The cartridge can filter out anything down to about 5 to 10 microns in size. A grain of table salt is about 90 microns; anything below about 35 microns is invisible to the naked eye. It is important to remember that with any filter a small amount of dirt actually aids the filtering process. In most areas cartridge filters are less expensive than diatomaceous earth filters but cost more that sand filters. However cartridge filters are more popular because of the minimal maintenance involved. Some families will find it sufficient to simply hose off the cartridge filter a few times during swimming season to keep them working properly. Others may need to soak the filters in detergent or replace them. In any case, maintenance takes only a few minutes to the filtration system in top shape. DE Filters, these products can filter out dirt as small as 3 to 5 microns. 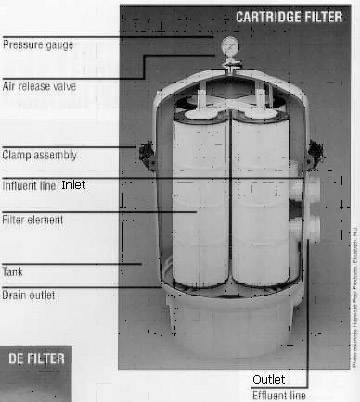 If you opened the tank of a DE filter it would look somewhat similar to a cartridge filter. But the grids are packed with diatomaceous earth, a powder made up of billions of fossilized plankton skeletons. It is the powder that actually catches and holds the dirt. DE Filters are usually the most expensive type, and they get your pool water cleaner than the other filters. But the necessary maintenance can be a drawback for some homeowners. Most manufactures call for backwashing to clean the filter. In backwashing, the system reverses the flow of water. The clean water cleanses the filter. The dirty water is drained from the system. John Doulton's son, Henry, introduced the Doulton Manganous Carbon water filter in 1862, the same year that Louis Pasteur's experiments with bacteria conclusively exploded the myth of Spontaneous Generation. This more advanced understanding of bacteria made it possible to direct Research and Development efforts to the creation of a porous ceramic capable of filtering our these tiny organisms. Laboratory testing has shown that, if designed and produced correctly, these devices can remove or inactivate almost all bacteria and protozoan parasites. Its effectiveness againstv viruses is unknown. Cleaning and maintenance of the filter is critical; so like other low-cost point of use systems, it is best combined with an educational program about safe storage, filter cleaning, and other recommended practices. 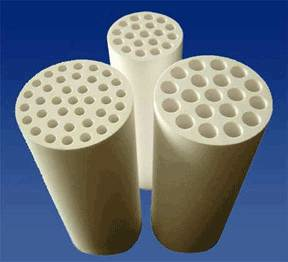 The advantages of ceramic filters are their ease of use, long life (if not broken), and fairly low cost. Disadvantages include possible recontamination of stored water since there is no chlorine residual and a relatively low flow rate-typically one to two liters per hour. Dr. David Manz developed the household biosand filter in the 1990s at the University of Calgary, Canada. 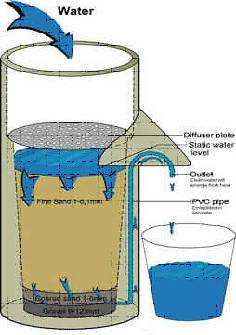 Dr Manz has trained many organizations on the design, construction, installation, operation and maintenance of the biosand filter. He also co-founded CAWST in 2001 to provide the professional services needed for the humanitarian distribution of the filter in developing countries. As of June 2009, CAWST estimates that over 200,000 biosand filters have been implemented in more than 70 countries around the world. Slow sand systems have recently been adapted for point-of-use systems, especially in developing countries. In this context they are generally known as "biosand" filters. Most commonly, a biosand filter takes the form of a container a little less than a meter tall and perhaps 30 cm in width and depth, filled with sand. The biologically active layer, which takes a week or two to fully develop, is maintained by keeping the water level above the top of the sand. 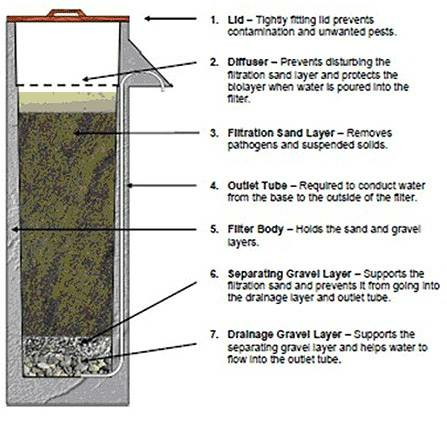 As with slow sand filters, this bioactive layer helps to filter, adsorb, destroy, or inactivate pathogens. A porous plate is usually located above the sand to prevent disturbance to the bioactive layer when water is added. Users simply pour water into the top of the apparatus, and collect treated water from the outlet. In laboratory and field testing, biosand filters have removed nearly all protozoa, and most bacteria. Their performance with viruses is not well established. The apparatus can be built using concrete-a commonly available and relatively inexpensive material. Maintenance is fairly simple, usually consisting of agitating the upper surface of the sand once a month or so and manually collecting the suspended material. 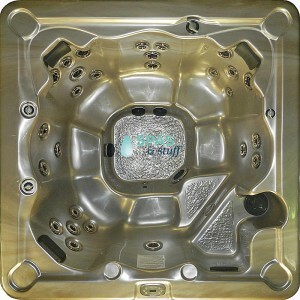 The cost of upkeep is quite low, since there are few or no parts to replace. 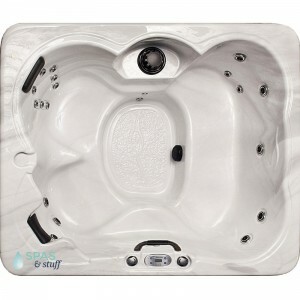 Make sure that the spa runs for at least one hour each day to ensure good water circulation and turnover of the spa water (even if no one is using the spa that day). 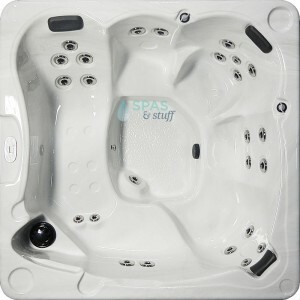 This provides sufficient filtering time for most spas. 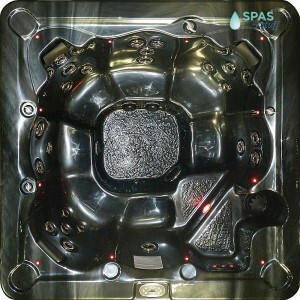 Also make sure you add Spa Bright and Clear (water clarifier) to the spa once per week, as this assists in filtering. (Note...do not use a water clarifier if you're using PH Balance). How often your filter cartridge needs replacing is dependant on a number of factors; the size of the filter, how often it's cleaned, how much the spa is used and how much debris gets into the water. Generally a filter needs to be replaced every one or two years, or if you notice any of the following; either of the plastic ends are cracked, fabric pleats separating from the plastic ends or cleaning it doesn't appear to get it any cleaner. How often the filter needs to be cleaned also depends on the size of the filter, how much the spa is used and how much debris gets into the water. 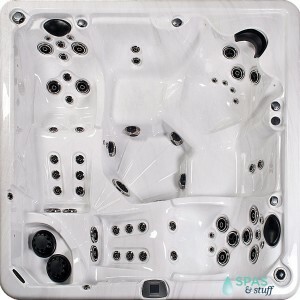 Generally portable or self contained spas should have their filters cleaned once a month. The best way to clean them is to blast them with a hose fitted with a high pressure nozzel (some people clean their filters at a local self serve car wash). Don't use any cleaning products not especially designed for cleaning filter cartridges. 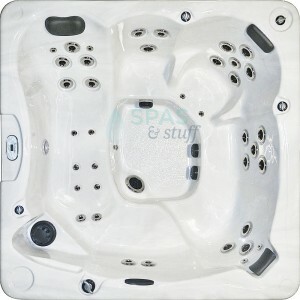 If your fitter is very dirty, it can be soaked over night using "Leisure Time Spa Cartridge Clean". Make sure to use some type of floating oil absorbing sponge in your spa, as these will greatly reduce the amount of oils that get into your filter. Remember also clean and replace them when they deteriorate. Do not use any soap based cleaners on your spa or the filter, and don't use car wax on your spa. 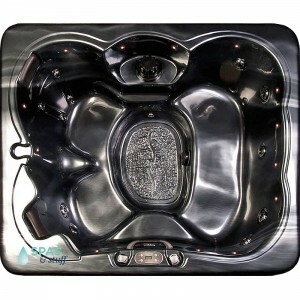 Cleaners designed for spas, like "Spa Gloss" work the best. Make sure you maintain proper water chemistry at all times. Filters are good, but they're not miracle workers and cannot actually kill off algae or bacteria! Use a reliable test kit. It's not a bad idea to have two filters and use them on an alternating basis. 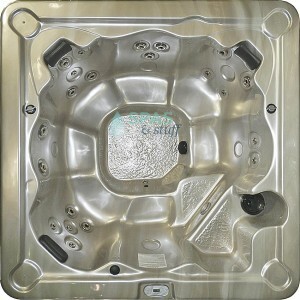 Switching them so that they may be cleaned thoroughly without loosing the use of your spa. Try to shower before using your spa. The worst enemies of filters are hair spray, mousse or styling gel, deodorant or anti-perspirant, sun tan lotion, excess sweat and skin creams of any sort. Conclusively, it's most important to keep oils or soaps of any kind out of your spa! Remember, a spa is not a bath! Following these simple handy suggestions will greatly add to the clarity of your spa water, and keep your filter working for months and months! Baker, M.N. and Taras, Michael J. (1981). The quest for pure water: The history of the twentieth century, volume 1 and 2. Denver: AWWA. Binnie, Chris, Kimber, Martin, & Smethurst, George. (2002). Basic Water Treatment(3rd ed.). London: Thomas Telford Ltd.
Buchan, James. (2003). Crowded with genius: the Scottish enlightenment: Edinburgh's moment of the mind. New York: Harper Collins. Christman, Keith. (1998). The history of chlorine. Waterworld, 14 (8), 66-67. Outwater, Alice. (1996). Water: A natural history. New York: Basic Books. Wilson, Catherine. (1995). The invisible world: early modern philosophy and the invention of the microscope. Princeton, NJ: Princeton University Press. 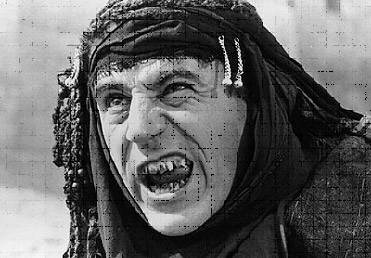 "I, (Rick Ricker), am the author of these articles, History of water filters and History of spa filters and I release its content under the terms of the GNU Free Documentation License, Version 1.2 and later."